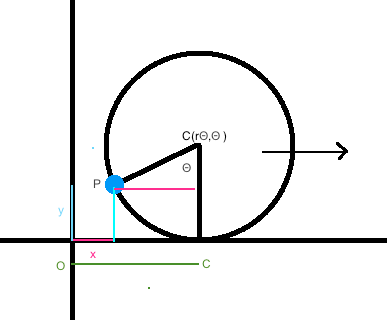 Since the point tracing out the cycloid, P, starts at the x-axis and rolls from the x-axis, it makes sense that it takes the cycloid a distance of 2πr to intersect the x-axis again. 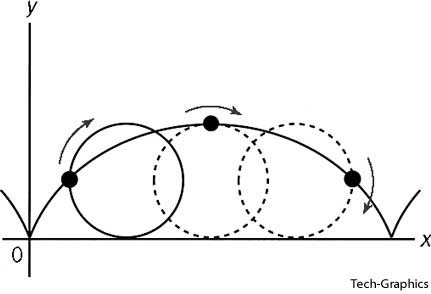 Thus, one arch of the cycloid occurs after a distance of 2πr rolls of the cycle takes place. Let's now analyze to see if these arches are semicircles. We know that the maximum height of the circle is going to be twice the radius, or 2r, which will also be the maximum height of the arch. We just defined the distance from the endpoint of one arch to the other endpoint to be 2πr. Clearly 2r ≠ 2πr/2 and 2r ≠ πr, thus, these arches are not semicircles.